Rabbi Yehoshua ben Levi said: "The eruv of the courtyards was established with the sole purpose of bringing peace." 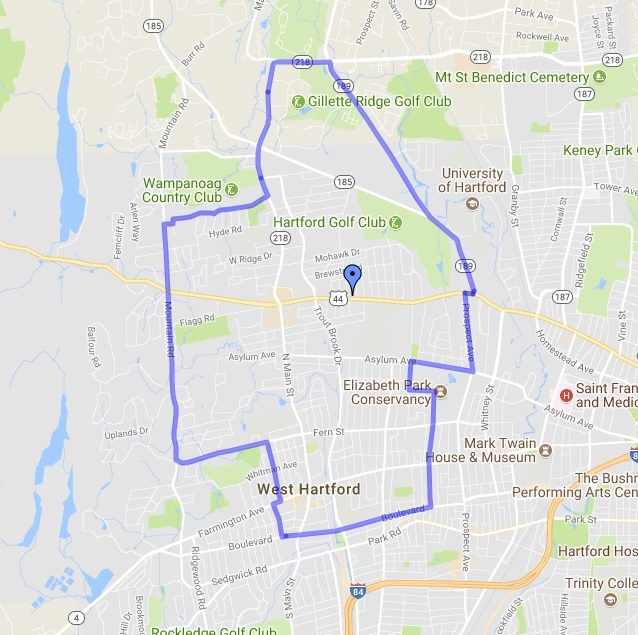 The local community eruv is checked and maintained by the West Hartford Eruv Committee, an association comprised laypeople from all of the local Orthodox synagogues under the rabbinic direction of Rabbi Tuvia Brander. A map of the eruv is below. Please check with the rabbi regarding the permissibility of carrying on Shabbat on the inside of any street along the eruv boundary. Some of these issues are listed below the eruv map. Download this KML file to access the eruv in your geospatial software of choice. The west side of North Main Street is outside the eruv from just before Sheep Hill Road northward. One cannot walk from North Main Street to Sheep Hill Road from within the eruv. To walk to Agudas Achim, one must walk carefully on the east side of North Main Street, or else use King Philip Drive to Tumblebrook Lane. The west side of Steele Road near Elizabeth Park is in the eruv, except at the intersection with Asylum Avenue. One can remain within the eruv by carefully walking around to the west of the telephone pole on the northwest corner of Asylum Avenue and Steele Road. The north east boundary of the eruv which runs along Bloomfield Ave does not consistently cover Bloomfield Ave. To approach the Hebrew Center, JCC or Federation campus, one should approach from the south and walk via Simsbury Road. The corner and intersection of Albany Ave and Bloomfield Ave is outside the eruv. Visiting our website, either directly above on this page, or on the right column of any page. Rabbi Yehoshua said: "Why do we mix together the courtyards [build eruvin]? In order to follow peaceful ways... and through the eruv the people will make peace."